Remember this on my felt cover for my dictionary~it was laid on the cover for the photo but it just seemed like it didn't belong there. 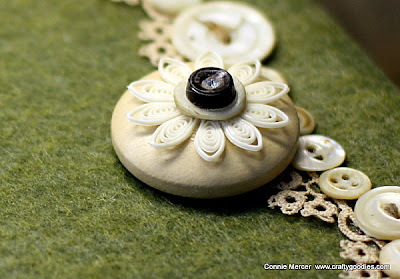 I love the upholstery button, the doily embellishment from JBS and the shell button and last, the shank button ~all stacked together like that. 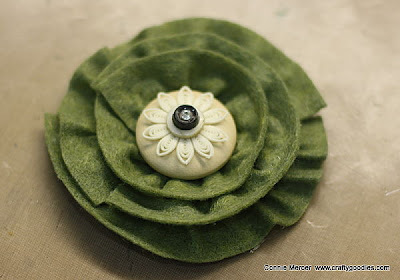 I thought it would make a beautiful center for a fabric flower pin. The pieces I'm using are the left over strips from the felt dictionary cover. The strips are about 6" long and I had 4 of them. 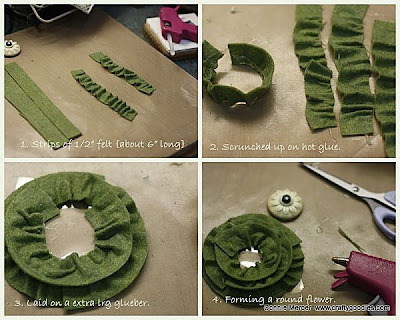 I put a line of hot glue on the Tim Holtz mat and scrunched up the felt along the hot glue line, giving the felt piece a gathered look. Then I used an extra large gluber by Cosmo Cricket and started , in a circular motion, covering the base of the gluber and leaving a space in the middle for the button. I hot glued it all down and added a felt circle to the back, of the flower, and then my pin . So, so pretty, Connie! Totally makes me think of spring. Ohhhhhhhhh I love it!! GORGEOUS!! I love this one too! Would look so good with the green I had on yesterday! oooo this is gorgeous. Can't wait to see where it goes from here. I neeeeeed to crawl in your brain for a bit LOL!!! Its so retro and vintage. Love it. Wow, this turned out GREAT. You always do simple beautifully. I think you sit up nights thinking up these wonderful try it Tuesdays. Love it, Connie.